And there begins a family’s story of renewal and recovery. 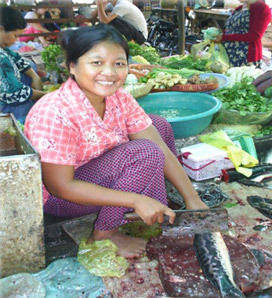 Paula helped Rudi’s birth parents set up a market stall in Phnom Penh and bought them a motor scooter to transport fish and vegetables to the market. Knowing how important it was for the children to get an education, Paula paid the school tuition for Rudi’s birth siblings, Sith, Srim, and Sal, at the Palm Tree Institute in Phnom Penh. When BB2C first met Rudi’s birth family, they were living in this lean-to against a factory fence. They had no food.